Frankfurt. 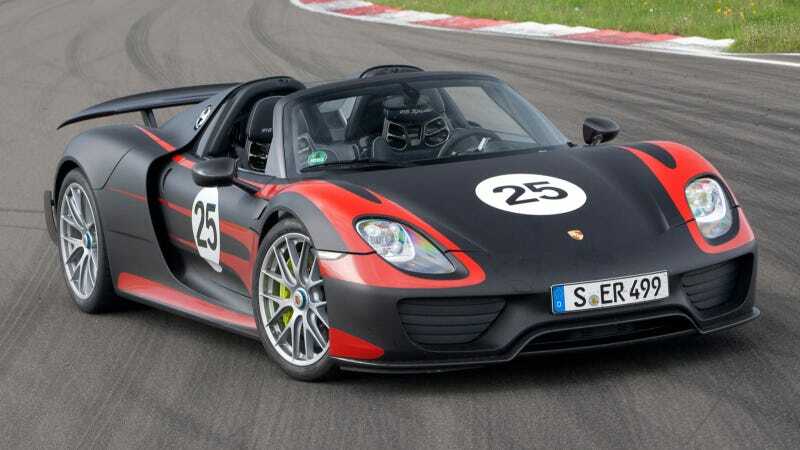 The Porsche 918 Spyder is celebrating its debut at this year's International Motor Show (IAA) in Frankfurt. The super sports car with plug-in hybrid drive marks the beginning of a new era for sports car manufacturing. Never before has a super car designed for everyday use offered such an impressive dynamic performance combined with the fuel consumption of a compact car. In setting this technological benchmark, the Porsche 918 Spyder is taking on a pioneering role similar to that of the 911 when it was unveiled at the IAA fifty years ago. To mark this anniversary, Porsche is presenting the "50 years 911" limited edition model. Based on the 911 Carrera S, this special model combines traditional 911 features with state-of-the-art technology. Porsche is completing its sports car line-up with the new 911 Turbo, which is being presented to the public for the first time. "From January to July, we were able deliver around 95,300 new vehicles worldwide – that's 17% more than in the first seven months of 2012,” said Matthias Müller, President and CEO of Porsche AG. “We are therefore very confident about the next few months and we now firmly believe we will have sold more vehicles by the end of 2013 than we did in the previous year. Based on how things are going at the moment, we are set to have another record year – and that's in spite of the fact that the present economic climate is far from satisfactory." Since its debut at the IAA in September 1963, the 911 has been revered by car enthusiasts around the world as the epitome of the sports car. The bestseller is now celebrating its 50th anniversary in Frankfurt, and Porsche is marking the occasion with a limited edition model based on the current 911 Carrera S. Only 1963 special models are available – the same number as the year of the 911 world premiere. In addition to a comprehensive features package and various visual references to the early years of this iconic sports car, this very special 911 model exclusively combines the wide body of the all-wheel drive models with the traditional rear-wheel drive of the original 911. The first 911 Turbo prototype was showcased at the IAA in 1973, ten years after the original 911 made its debut. For the 40th anniversary of the model, Porsche is presenting the new generation 911 Turbo and Turbo S, which offer the pinnacle of technology and dynamic performance in the 911 model line. Features like all-wheel drive, active rear-axle steering, adaptive aerodynamics, full-LED headlights and a 560-bhp, flat-six engine with double turbocharging underscore the role of the new 911 Turbo as a technological benchmark both for race cars and super sports cars intended for everyday use. The dynamic performance has also been improved via the active Porsche Dynamic Chassis Control (PDCC) rolling-motion compensation system, which is making its first appearance in the 911 Turbo models. This system is part of the standard equipment for the 911 Turbo S, as is the Sport Chrono package with dynamic engine mounts and PCCB ceramic brakes, all of which are also available as an option for the 911 Turbo. These modifications reduced the lap time of the new 911 Turbo S at the North Loop of the Nürburgring to 7 minutes and 27 seconds – on standard production tires.